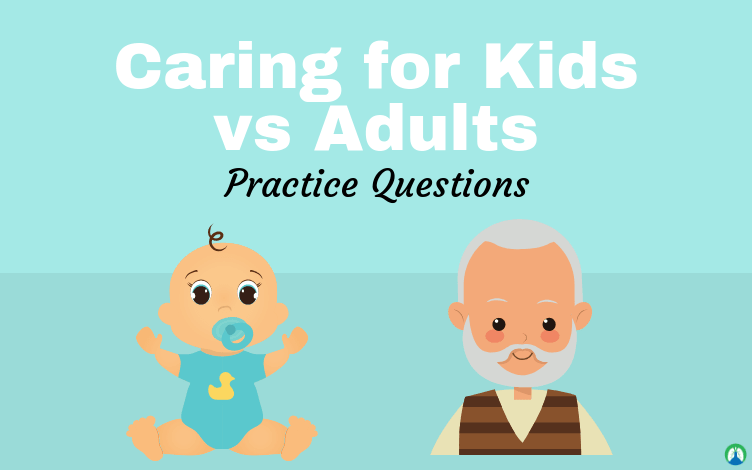 As a Respiratory Therapist, it is vitally important to know the difference between caring for kids vs adults and how to properly treat each effectively. This could be certain medications, doses, therapies, oxygen, and of course, mechanical ventilation settings. Obviously, treating an infant is completely different than treating an adult, which is why it is important for you to know how to treat them both respectfully. That is why we created this study guide that is loaded with practice questions to help you do just that. Let’s dive in! 1. How many pediatric hospitals are registered in US? 2. What are the important traits for providing care to any patient? 3. What are advanced levels of care? INO, HFV, ECMO, and Heliox. 4. What does INO stand for? 5. What does HFV stand for? 6. What is the ECMO procedure? It is the transfer of O2 from the blood, then back in. 7. What does a child need when he is less than 32 weeks? 8. What type of breathers are infants in general? 9. What is the smallest portion of the airway in a child? 10. What is smaller in children compared to adults? 11. What protects the airway? 12. What blade helps get the large epiglottis out the way in children? 13. What is the part of the body of an infant that can be lifted with a towel for good airway positioning? 14. What body part of an adult can be lifted with a towel for good airway positioning? 15. In infants, the ribs and sternum are mostly composed of what? 16. In general, the chest wall is related to what? 17. What type of breathers are infants because their diaphragm drops? 18. Airway diameter increases with? 19. What occurs during the first 3 years? Large portion of lung proliferating (growth). 20. What is missing in alveoli for newborns which is structurally different? Pores of Kohn (small openings). 21. What is lower with Infants and children? FRC which is the amount of air remaining in the lungs after expiration. 22. What decreases lung capacity? 23. What is basal oxygen consumption in infant? 24. Children can desaturate quickly but they usually do what? 25. What is faster in a younger child? 26. What can we give when the heart is under stress? 27. What can we give to the infant during bradycardia? 28. What can happen if we give the infant too much oxygen? 29. Where can we stick an ABG on a child because there is more blood flow? The brachial or femoral artery. 30. What is the noninvasive method of measuring arterial oxygen saturation? 31. What is the normal pulse SpO2? 32. What does an ABG check? Ventilation, oxygenation, and acid base. 33. What is the meaning of TCM? 34. How does TCM measure the skin surface PO2 and PCO2? Electrochemically by heating localized areas of skin. 35. TMC doesn’t work on what parts of the body? An injury or over bone. 36. What is the meaning of CBG? 37. Where can a CBG be drawn from? Warmed heel or sides of the tips of fingers or toes. 38. What will happen when having excessive squeezing or milking during CBG? Contamination with venous blood and interstitial fluid. 39. When dealing with children, we don’t have to focus on what medication? 40. What is the meaning of pMDI? 41. What should children younger than 5 use for aerosol therapy? They should use a mask and spacer. 48. What should be the basis for selecting equipment? 49. Which laryngoscope blade is for patients less than 3 years of age? 50. What is the calculation for depth of the endotracheal tube? Weight in kg + 6. 51. How do we determine the ET tube size in neonates? Gestational age (weeks), weight, tube size (cm), and location marking at lip (cm). 52. What should be the basis for selecting the ET tube size for children greater than 1? ETT size = (16 + age in years)/4. 53. What are two reasons why all respiratory therapists should be able to care for pediatric patients? long-term and respiratory care make up a significant portion of home care services. 54. What are the key differences in the anatomy of children compared to adults and their implications for the respiratory management of pediatric patients? This is seen clearly when studying the nasopharynx, oropharynx, and pharynx. 55. What is the nasopharynx? The upper part of the pharynx connecting with the nasal cavity above the soft palate at the back of the nose and connects the nose to the mouth, which allows a person to breathe through the nose. The soft palate separates the nasopharynx from the oropharynx, which sits just below the soft palate. 56. In general, infants are obligate what? 57. Whom has the much larger size tongue? 58. Children have larger what? 59. Which is larger in infants than in adults? 60. Which opening has an acute angle in infants than in adults? 61. The angle between what opening in infants is more acute than in adults? 62. What is the smallest portion of the airway? 63. What in a child is smaller, shorter, and more malleable than in adults? 64. What do children have that is smaller than adults? 65. What is the epiglottis? It is a flexible flap at the superior end of the larynx in the throat. It acts as a switch between the larynx and the esophagus to permit air to enter the airway to the lungs and food to pass into the gastrointestinal tract. 66. What is an extremely preterm neonate? Less than 32 weeks of gestational age. 67. What is a moderate preterm neonate? 32 to 36 weeks of gestational age. 68. What is a late preterm neonate? 34 0/7 to 36 6/7 weeks of gestational age. 69. What is a full-term neonate? 38 to 42 weeks gestational age, to the first month of postnatal life. 70. What is considered an infant? 71. What is considered a toddler? 72. What is considered a preschool age child? 4 to 5 1/2 years. 73. What is considered a school-age child? 5 1/2 to 12 years. 74. What is considered an adolescent? 75. What is considered an adult? 76. What is the requirement in general for pediatric patient care? Early recognition of a child in distress (epiglottis). 77. What advanced level of care do skilled respiratory therapists observe? 78. What is the anatomy of the thoracic cavity? An infant’s ribs and sternum are mostly cartilage. Ribs lay more horizontal in infants than in an adult horizontal. Breathing in infants is mostly diaphragmatic (making them abdominal or belly breathers). Right main stem angle at the carina is lower in children than in adults. The diameter increases with lung growth. Alveoli stops proliferating when the body growth stops. A large portion of lung proliferation occurs within the first 3 years of life. 79. What is the anatomy of the thoracic cavity in infants and children compared to adults? Alveolar sacs are structurally different in a newborn. Alveoli in newborn also do not have Force of Kohn which is the small openings thought to exist between adjacent alveoli. Infants and children have a lower functional residual capacity which is the amount of air remaining in the lungs after a normal expiration. Also, infants and children have larger hearts in proportion to the thoracic diameter, which decreases lung capacity. Infants have more compliant chest walls. A child’s lungs have less elastic recoil than an adult. Children have a larger abdomen which pushes up against the diaphragm. The basal oxygen consumption is twice that of adults. 80. How much basal oxygen consumption occurs for children? 81. How much basal oxygen consumption occurs for adults? 82. Children have a lower what? Pulmonary reserve but have an increased oxygen consumption. 83. Children will do what more rapidly than adults? They will desaturate more rapidly. 84. What is the normal newborn heart rate? 85. What is the normal newborn respiratory rate? 86. What is the normal newborn blood pressure? 87. What is the normal infant heart rate? 88. What is the normal infant respiratory rate? 89. What is the normal infant blood pressure? 90. What is the normal heart rate for 1-3-year-olds? 91. What is the normal respiratory rate for 1-3-year-olds? So there you have it. That wraps up our study guide about caring for kids vs adults. I hope this information was helpful for you, especially if you are interested in working with neonates or pediatrics one day. 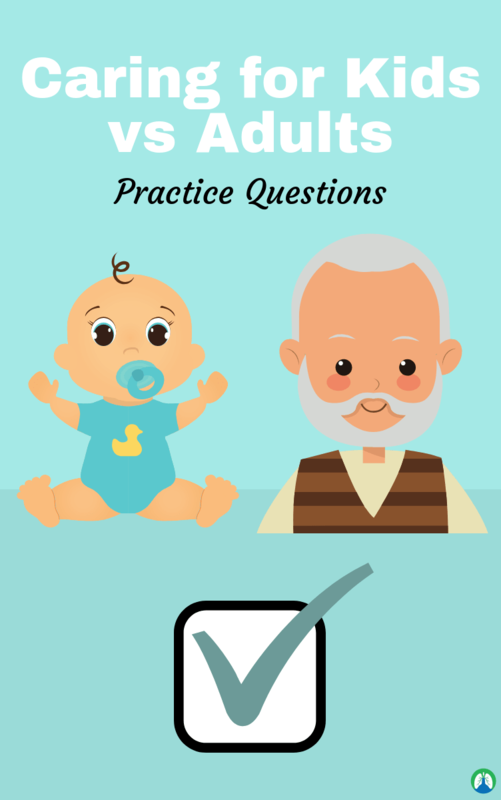 Just make sure you go through these practice questions until the information sticks because it is very important to know. Thank you for reading and as always, breathe easy my friend.